In a large bowl mix together the cabbages, carrots, bell peppers, onions and jalapeno peppers. 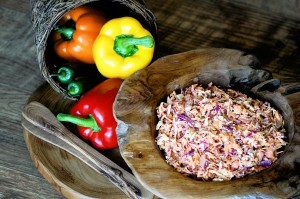 Then add the John’s Famous® Slaw Dressing and toss until well blended (salt and pepper to taste). Refrigerate for at least 30 minutes. Enjoy!